Renewal by Andersen is the full-service replacement window division of Andersen Windows. We provide a streamlined window replacement process that makes it easy on homeowners looking for brand new replacement windows throughout their home in Seattle, WA. Our windows are beautiful, energy-efficient and custom designed and manufactured to fit your unique needs. 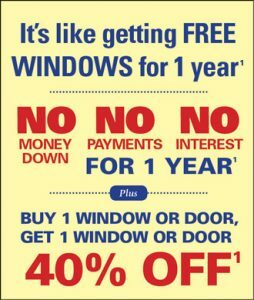 Give us a call today to schedule your free in-home window replacement consultation. Renewal by Andersen of Seattle, WA values quality service and products. Renewal by Andersen is the “Do it For Me” company. We’ll take care of you from the initial sale, all the way through the installation and even after that if there is any service work that needs to be done. Once you decide to go with Renewal by Andersen windows in Seattle, we will have somebody dedicated to coming back out to your home and confirm all the measurements because all of our replacement windows and patio doors are custom made to order. We offer multiple high-performance glass solutions that make it possible to get Energy Star Certified replacement windows and patio doors no matter where you live in the country. When you choose Renewal by Andersen window replacement, you will enjoy many years of indoor comfort, low-maintenance and energy efficiency. When over 100 years of refined craftsmanship is fused with today’s most advanced technology, the essence of who we are transforms into a superior and stunningly beautiful window. Renewal by Andersen has an outstanding limited warranty program that covers the window and the installation. Renewal by Andersen® replacement windows and doors are ENERGY STAR® certified. Installing them in your home can help reduce your monthly energy bills and carbon footprint by about 12% nationwide compared to other products on the market. Welcome to Renewal by Andersen windows of Seattle, WA. We are Bellevue, Newcastle and Seattle’s source for custom fitted, energy efficient window replacements and patio doors. The process starts with a no-cost in home consultation where we come to you, help you choose the perfect style and trim. In addition we will perform an energy analysis to help you find out how much energy loss your home is experiencing through your current windows. Our past customers appreciate the fact we work on your schedule and help you learn more about what makes our products so special right from the comfort of your home in Seattle or nearby towns. With Renewal by Andersen replacement windows of Seattle, WA you get much more added value than you would receive with traditional window or door installers. You receive the peace of mind that comes with working with a company that specializes in only windows and doors and has for well over 100 years. Next, you are guaranteed your windows will last with our high quality construction and warranty. Our windows are so coveted they can substantially increase the value of your home as well. Most importantly you get the best customer service in the industry and a finished product that matches the exact vision you have for your home. Renewal by Andersen window replacement is proud to serve the Seattle, WA area with the most advanced energy efficient windows and patio doors on the market today. Upload photos of your home. The app creates a 3D Model.